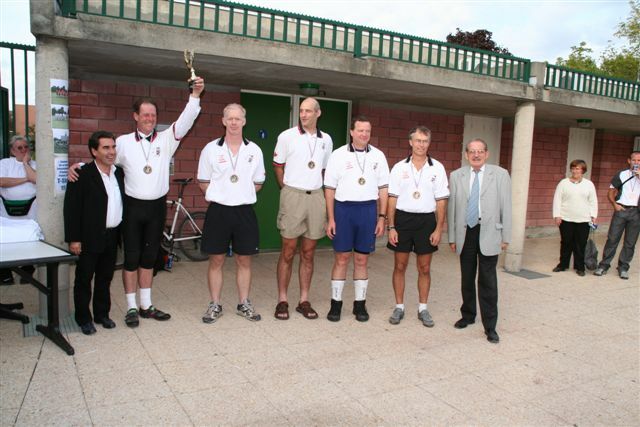 Harvey Barton, Geoff Nielsen, Peter Furmedge, Bill Matheson, and Mike Boyd. and executive vice-president of the Youth & Sports medalists Committee of Seine-St-Denis. In what proved to be the most competitive international tournament of the year in terms of countries represented, Canada regained the winning form that earned two International Championships in 2002 and 2003, defeating France 6-4 in the final game to take the gold medals. Six teams representing four countries entered the event, which was played in a single day prior to the Sixth Annual Autumn Cup. The teams were divided into two divisions, with Canada, Dublin Obelisk, and Gervais-Lilas in one, and France, Dublin Phoenix, and Scotland in the other. Canada began play with an 11-1 win over Dublin Obelisk, while France got off to an even more impressive start with a 16-0 victory over Dublin Phoenix. In the second set of games, Gervais-Lilas got by Dublin Obelisk, 8-5, while Johnstone added to Dublin Phoenix's misery 15-0. Despite the relative ease of their win over Dublin Obelisk, Canada had all kinds of trouble with Gervais-Lilas, just eking out a 10-9 victory to advance to the final. France had an easier time with Scotland, posting a 10-4 margin. Canada edged France 6-4 for the gold medals, while Gervais-Lilas edged Scotland 4-3 for the bronze. Dublin Obelisk edged Dublin Phoenix 5-3 for fifth place.